Flying with a baby is inherently anxiety-producing. What if they’re restless and won’t sleep? What if they cry the whole time? It’s understandable to be nervous, but flying with a baby doesn’t have to be a bad experience. The trick is to stay calm and plan ahead. 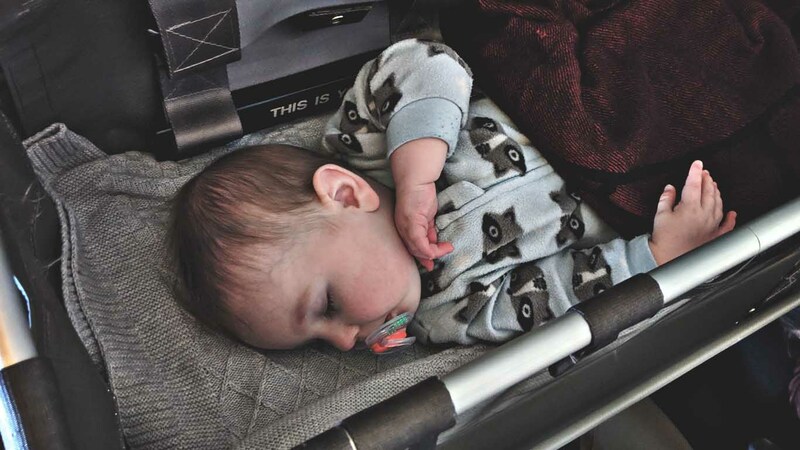 That’s why we’ve put together this list of 9 tips to help you get your baby to sleep in the on a plane, and make flying as smooth as possible! If you want your baby to sleep during some or all of the flight, a red eye may be your best bet. If your little one has been awake for most or all of the day, they are bound to be tired by the time you make it to the airport, check your bags, go through airport security, and eventually board the plane. If your flight is after your baby’s normal sleep time, you might consider putting them to bed at the usual time and then waking them up when it’s time to leave for the airport. This may prevent your baby from becoming overtired and help them fall back asleep more quickly once you are on the plane. Other passengers are also likely to be more quiet on a red eye, and night flights are generally less crowded, which may limit noise and unnecessary stress for you and your baby. If you’ve flown with a baby before, you know one of the biggest challenges is figuring out how to keep them comfortable (and hopefully asleep) in the air. You generally don’t have to buy a ticket for kids under two. Unfortunately, that usually means you end up holding your baby the entire time. You can request an bassinet seat (also called a bulkhead seat), which can make the entire experience much more comfortable for you and your baby. Airline bassinets are small beds that hang from the wall of the plane. Most airlines don’t allow you to request a bassinet seat online, so you may need to book your flight over the phone. You may need to settle your baby in your arms first before transferring them to the bassinet. Keep in mind that most airlines require you to take your baby out of the bassinet and hold them during turbulence. If you can’t secure a bassinet seat, you may want to consider purchasing an inflatable travel bed for your baby. Inflatable beds can be a good option if your baby has trouble getting back to sleep after being moved, since some of these beds (like this one from SkyBaby) can be used with the plane’s infant lap belt. This means that you won’t have to disturb your baby’s sleep if you run into turbulence. Some travel beds sit on top of a seat or on the floor, while others are designed for you to hold your baby in your arms while they’re snuggled up in the inflatable bed. Most travel beds are relatively affordable and you may find that the bed comes in handy during other portions of your trip as well, such as on bus or train rides. Where you sit can make or break a flight. Choosing the right seats is even more important when you’re traveling with a baby. Most airlines let you select your seats online when you book. If the site you’re using doesn’t have this option, you may need to call the airline to see if they will reserve a seat for you and your baby. The back of the plane is generally less crowded and closer to the restrooms for in-flight diaper changes. If you opt for a bassinet, you will likely need to get a bulkhead seat. These seats often go quickly, and some airlines only have a few, so it’s important to book early. Window seats provide more privacy if you plan on breastfeeding during the flight; however, you may end up climbing over other passengers to get to the restroom. Although taking your baby on a plane is bound to disrupt their usual schedule, taking steps to keep their routine as normal as possible can go a long way in keeping them comfortable and getting them to sleep. Changing your baby’s diaper just before you board is a good way to limit the number of times you have to change them on the plane. You can also keep things familiar by dressing them in whatever they usually wear to bed and bringing along any stuffed animals or blankets they sleep with. 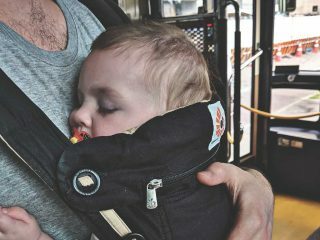 Following your baby’s usual pre-nap or pre-bedtime routine as much as possible while traveling can increase the odds that they will fall (and stay) asleep during the flight. For example, if your little one is used to being read to or hearing a lullaby before bed, you may want to do so after takeoff (obviously, keeping other passengers in mind). Like adults, some babies experience ear pain during takeoff due to changes in cabin pressure. This may cause your baby distress and may make it more difficult for them to settle and fall asleep after takeoff. Breastfeeding, bottle feeding, or sucking on a pacifier can help relieve any pain or discomfort your little one experiences during takeoff and landing. Not all babies experience ear pain, but it is better to be safe than sorry, especially since an unpleasant takeoff can make the entire flight more difficult for both you and your baby. 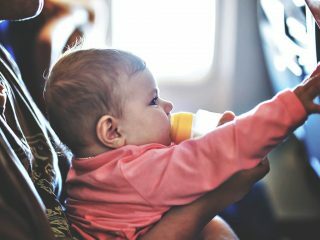 Feeding your baby during takeoff may also help them fall asleep more quickly once you’re in the air, especially if they are used to being fed right before a nap. 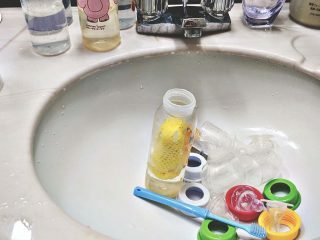 Again, try to stick to your baby’s usual routine. If you usually bottle feed them before bed, it is a good idea to bottle feed them on the plane. Sometimes a comforting or relaxing scent can make all the difference in the world when it comes to getting your baby to sleep on a plane. Baby pillow sprays (like the lavender- and chamomile-scented This Works Baby Sleep Pillow Spray) are meant to be sprayed on your little one’s pillow or other bedding just before bed. The This Works pillow spray is approved for babies who are at least six months old. The spray is also free of parabens, phthalates, sulfates, and other harsh, unnatural chemicals, so you don’t have to worry about skin irritation or allergies. Bringing a sleep pillow spray to use on your baby’s bassinet or inflatable travel bed on the flight is especially important if your baby is used to using one at home, as it may add a sense of familiarity and make it feel more like home. Some babies need a physical barrier between them and whatever is going on around them to fall asleep on a plane. Sometimes you get lucky and the plane is relatively calm and quiet, but you can’t always rely on this, even on a red eye. The people behind you may be talking, the person next to you may be watching a movie, and there may be flight attendants and other passengers moving through the aisles. If your baby is used to sleeping in a dark, quiet room free from distractions, try building a tent around them using an airline blanket or a blanket you bring with you. Tuck one end of the blanket into the headrest of your baby’s seat. Lay the other end of the blanket across your baby’s tray table. Close the tray over the end of the blanket and lock it in place. It’s easy to get flustered when your baby starts crying in public–especially in an enclosed and crowded space like a plane. Staying calm and taking the usual steps to help your baby settle down is often the best way to encourage your little one to relax and go back to sleep. Don’t forget to breathe; chances are they won’t cry the entire flight. Don’t let annoyed passengers get to you; flying with a baby is no walk in the park and you’re doing your best! If there’s a blanket or toy that helps your little one settle down, see if that does the trick. Don’t forget to check for the usual culprits. Does their diaper need changing? Are they hungry? 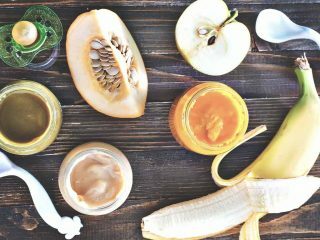 Mighty Moms suggests ditching your usual feeding schedule while traveling. Nothing calms a crying baby quite like being fed. Should you use medicine to sedate your baby? Some parents are tempted to use over-the-counter medications (like Benadryl or Dramamine) to help their babies sleep on long flights. But, pediatrician Jennifer Shu warns against using sedatives for children under two. Shu says that, instead of getting sleepy, some babies experience the opposite symptoms with antihistamines and other sleep-inducing drugs. Plus, these medications can, in rare cases, cause irregular heartbeat, seizures, and other potentially dangerous symptoms. Hopefully you found this article beneficial, and helpful in preparing for the next adventure with your little one! If you want to know more about planning to fly, getting through the airport and surviving on the plane we have a more detailed guide to flying with a baby. I wish you safe (and hopefully sleepy) travels!